Woodland Park Zoo Blog: Parents’ Night Out…fun for kids too! While our almost-five-year-old daughter, Elena, has come with us in the past to many ZooTunes concerts (her first live music experience ever was They Might Be Giants when she was just six weeks old), WPZ was offering an interesting new option the night of The B-52s concert: Parents’ Night Out childcare! I knew I’d be more willing to dance embarrassingly to an 80’s band without any chance of grandma hearing the next-day report of how weird I am. Elena was excited too—why hang around with mom, dad, and their friends when you can play all evening at Zoomazium? 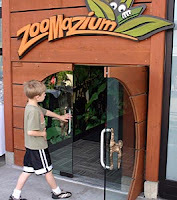 “Then we went to Zoomazium and played. We played a lot of games, and Margaret is the silliest “Red Light, Green Light” player ever! Point taken. And there will definitely be a next time! Zoomazium photo by Ric Brewer. My six-year-old son was there too and also LOVED it. It was so funny to read your daughter's experience because his was almost identical (please tell Margaret he gets this HUGE smile on his face when talking about the "Red Light, Green Light" game). And I will definitely let him know that we were in fact, NOT the only parents who showed up to pick up their kids. ;) He, too, told us he didn't want to leave.